As part of the Onyx Villas private villa compound, Villa Galam is a two-bedroom holiday retreat with a comfortable and inviting atmosphere for smaller families and couples. 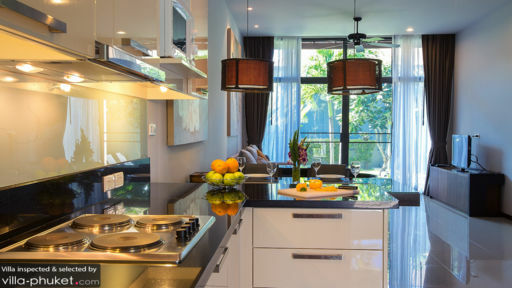 The villa is located on the island of Phuket, and is close to the popular Nai Harn beach. Guests have access to the outdoor pool, which is open year-round, as well as the free wi-fi at the villa! Since the villa is close to all the best places in Phuket, it is a prime location where you get the chance to explore the island either on foot or on rented bikes! 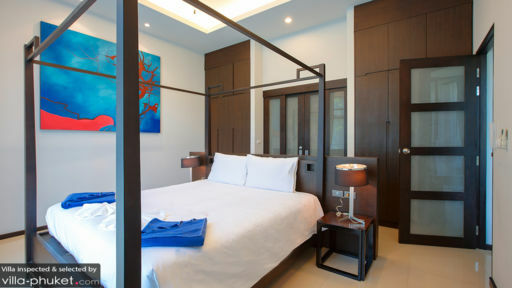 There are two bedrooms at Villa Galam that are well-furnished and air-conditioned. While the master bedroom is furnished with a canopied king-sized bed, the other bedroom is furnished with a regular king-sized bed. 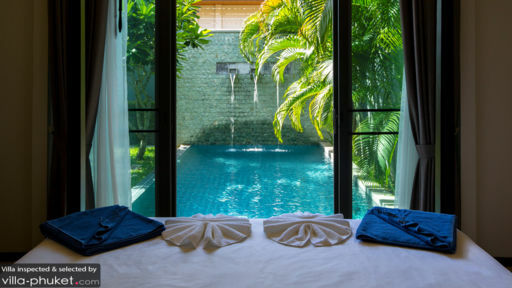 The master room is connected to the swimming pool, so as soon as you open the glass doors, you can step right into the cool waters of the pool. There is a private bathroom for the guests, which is fitted with modern amenities like a bathtub, and a shower area which is quite spacious and comfortable. With walled gardens, you get to experience the luxury of a private space designed especially for your comforts and convenience. The large swimming pool is nestled amidst tropical foliage and ample greenery, which is complimented by the clear blue skies. The beautiful and tranquil space will ease all your worries instantly, as you breathe in fresh air and enjoy the blissful quiet and calm surroundings of Phuket. Villa Galam also provides you outdoor dining areas, perfect for your morning or evening tea you can enjoy while taking in the scenic beauty of the villa. The living area is a large and spacious room which also houses the dining and kitchen area as well. The room connects to the outdoors through a glass doors, and opens out directly to the pool deck. As you step inside, the sitting area is the first thing you see, furnished with plush couches and a coffee table, all placed around a flat-screen TV, which you can use as per your wish. The contemporary décor of the living area is reflected in the artwork that lines the walls, as well as the choice lighting in the room. The dining table is placed in the middle of the room, which can conveniently accommodate four guests, without any problems. There is a fully-equipped kitchen also accessible to the guests, as it is a self-catered property, you can use the modern appliances and amenities to cook delicious meals. With services and staff that will put your mind at ease, you can enjoy your stay at Villa Galam without a worry, as the staff will take care of everything. The guests can also make use of the laundry room as per their convenience. The villa is child-friendly and you can even request for a baby-cot if you are traveling with kids. There are several beaches in the vicinity of Villa Galam, such as Nai Harn and Rawai amongst others. Guests have the opportunity of going snorkelling, diving or even sailing while they are out exploring the sandy shores of the beaches. If you are a foodie, then you can go restaurant hopping, as you make your way around the many restaurants offering multiple cuisines to tingle your tastebuds!